I came across light therapy (formally known as photobiomodulation in the medical community) in 2017. 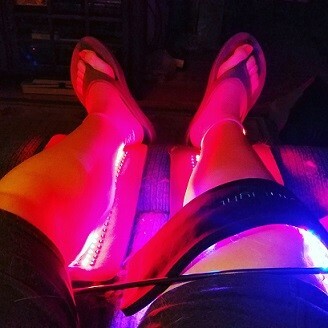 I utilized the inLight Medical Systems to help with pain, muscle stiffness, and muscle spasms and as a way to increase circulation to localized areas of my body, therefore, giving my body a better chance to heal itself. When I saw the great results I had, my family tried it as well with similar success. Being the curious nerd that I am, I had to figure out why and how it worked which led me to seek the education that allowed me to become a certified light therapist. I also use it regularly on my aging cats and dogs and my husband and parents also use light therapy regularly. You may have heard of light therapy for season affective disorder (SAD), but light also stimulates other physiological processes in the body. If you have ever heard of "cold laser therapy" for pain management and helping the body to heal itself, these devices work in a similar way. As a Certified Light Therapist, I could open my own business built around giving light therapy sessions, but I've chosen to use my knowledge in a different way to help people. My main passion is golf instruction and my secondary passion is helping people maintain the necessary health and wellness in order to participate in the activities they love, such as golf. As I have used light therapy products over time and increased my knowledge surrounding the subject, I have come to realize that it is best to have light therapy technology at your own disposal in your home. Light therapy is my family and I's first line of defense when it comes to aches, pains, and stiffness. Laser vs LED: Even though light therapy has been around for a long time and proven to be very safe, there has been an exponential increase in the understanding of how light produces a physiological effect (photobiomodulation). This is due to the increase in the technology of medical imaging devices and the increased interest from the medical community in discovering that light therapy can actually assist the body in many ways. If you go to pubmed.gov and search the medical literature (LLLT or the new term, photobiomodulation), you can find over 5000 medical articles. The main one I want to point out is that they have discovered that effectiveness is not determined by the delivery method of laser vs LED, but rather based on wavelength and dosage. So if you are a skeptic like me, feel free to read this article: https://www.ncbi.nlm.nih.gov/pmc/articles/PMC3799034/ Plus there is an added benefit that LED is safer than laser because you won't shoot your eye out with an LED. Photonic Therapy Institute (PTI) sells portable, handheld light therapy devices (called torches) that can be utilized on any part of the body where you would like to deliver light. They were created by Certified Light Therapy Instructor and Practitioner, Kaye Aubrey-Chimene, who saw a need for an affordable product that delivers a quality dosage of light in a proper wavelength. Many people also use these on acupuncture points to deliver similar benefits without using needles through a process called photopuncture. PTI also offers a free Introduction to Light Therapy Course if you would like to learn more and also serves as an education provider for people interested in learning more about light or becoming a Certified Light Therapists. You can order these devices directly through PTI. Note that the torch I am using on my tweaked ankle in the photo is not from PTI. I spent substantially more money on another brand (that actually delivers a lower dosage) prior to PTI creating and selling their own torches. Had my decision been made today, I would have purchased my device from PTI. P.S. Isn't my tan line great? I personally use both and here is why: It depends on how you would like to use the device and if you have access to a power source (see photos above). The inLight Medical Systems are designed to cover a large area and must be used near a power source (think of relaxing in your recliner or back at your hotel). 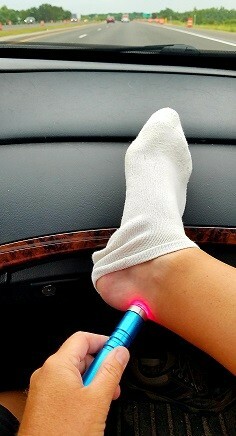 The torch based devices are designed to be used anywhere. They are portable and require no power source (rechargeable battery) with the main drawback being they cover a very small area at a time. Both products use what the light therapy community calls a therapeutic dosage: The PTI torch used on the high setting delivers the same amount of light in 1 minute as a 20-minute session with the inLight system (when referring to a specific point on your body). Wondering why you would ever use a pad-based system? Imagine trying to move the torch every minute to a new location to get the same amount of coverage as a pad based system - it would take forever. The inLight System also delivers 2-3 beneficial wavelengths at a time providing multiple depths of light penetration into the body whereas the torch delivers one wavelength (depth of penetration) based on the unit you purchase. Finally, the torch offers a single pulse setting option and the inLight System offer multi-pulse technology based on the principals of frequency medicine. Overall you base your decision on what fits your needs, budget, and lifestyle the best and I am here to assist you in making that choice. Below are some disclaimers that none of us are doctors or medical professionals and cannot diagnose or cure you in any fashion. You can try light therapy and see if it helps you feel better, but it is not approved or cleared by the FDA to "fix" any specific medical conditions. Keep the medical stuff between you and your medical professional, and if you are looking for tools that help with your health and wellness, I'm your gal. Capiche? Laura Patrick is NOT a licensed physician (or veterinarian) and is unable to cure, diagnose, mitigate, prevent or treat conditions. Light therapy, Titleist Performance Institute screenings/information, Rotex Motion Exercises, Mach 3 Speed Training, and HeartMath tools should not be used as a replacement for medical treatment from a licensed physician or other healthcare provider.